OK, so it’s not technically a taco, but it is Tuesday and this was pretty tasty. Hubby and I must have been on the same wavelength. I saw a post for Vegan Taco Tuesday and knew I had the perfect set of ingredients to make some black bean and avocado tacos. I worked late and when I got home, hubby had already eaten but left me some chopped tomato, avocado and polenta. So…. 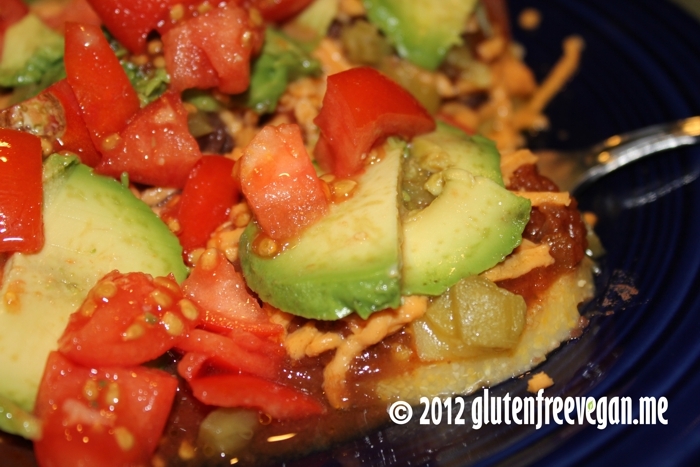 quick and easy, 1. slice the polenta, 2. top with black beans, salsa, green chilies and Daiya cheddar, 3. heat and 4. add diced tomatoes and sliced avocados. Ta-dah. Quick dinner and almost Taco Tuesday! This entry was posted in main dishes, Meals in Minutes, Recipes and tagged avocado, black beans, daiya cheddar, gluten-free, glutenfreevegan.me, glutenfreeveganme.com, green chili, green chilie, healthy, polenta, quick vegan, recipe, salsa, taco tuesday, vegan, vegan cooking, vegan recipes. Bookmark the permalink.